This is a great stand-alone coffee maker you often seen in western movies. People use this on camping trips because it requires no filter and no electric. The pot is stainless steel and durable so you can wash it easily. Works on a stove or fire pit used when camping. The only part that is somewhat fragile is the glass perk top where you can see your coffee brewing. These are glass, and without the perk-top, the coffee maker is not usable. 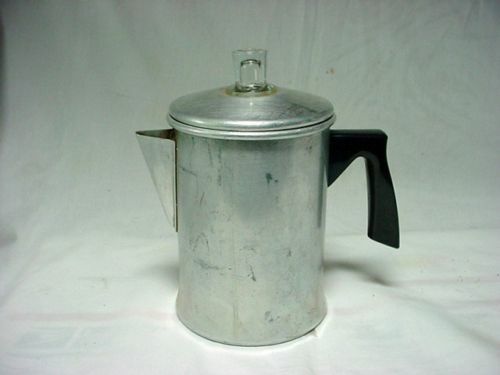 You can use it at home too, and it is neat to see the coffee brewing in the glass perk-top, like you sometimes will see in coffee commercials.Vintage brand names include: Foley.